This article is about Pikachu's appearance in Super Smash Bros. Brawl. For this Pokémon in other contexts, see Pikachu. 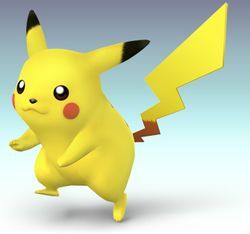 Pikachu (ピカチュウ, Pikachu) is a returning veteran character in Super Smash Bros. Brawl. It was confirmed along with Mario, Link, and Kirby in the E3 2006. Ikue Ōtani reprises her role as Pikachu's voice actress in all regions of the game. with mostly recycled voice cilps from Melee, while providing some new ones. It is currently in the B Tier and holds 8th position, a slight increase to its C Tier status in Melee, where it is ranked 9th place. Pikachu has decent KOing power (though it can rely on Thunder in some situations), quick overall speed, very good recovery with many options as well as being unpredictable, good edgeguarding game with a quick and powerful neutral aerial and tricks that allow it get to the edge quickly, and a good grab and throw game (having two chaingrabs). Brawl's new physics have also helped it a lot; Pikachu is harder to combo, its grab range is no longer the shortest, its Thunder is not as laggy, and it gained various new tactics such as Quick Attack cancelling. Pikachu also has strong momentum cancelling abilities, with its up aerial and Skull Bash being very useful in this particular aspect. In addition, Pikachu has a great defensive game, with its QACs being very useful for avoiding pressure, escaping certain situations, and playing mindgames. It also possess one of the best spot dodges in the game along with Link, Falco, Yoshi, and Toon Link. It also has useful OoS moves such as up smash and neutral aerial. However, it has a relatively weak air game, placing it at a disadvantage against characters with particularly powerful air games, such as Marth. It also has subpar range in most of its attacks, with its best finishers having hitboxes close to its body, or in the case of its forward smash, the furthest hitbox is much weaker than the closest, making good spacing an all-around threat to Pikachu, as well as making it more difficult to land its better finishers. Regardless, Pikachu still has great matchups, including being the only character with an even matchup against Meta Knight on the BBR's matchup chart (though this matchup is highly disputed, with most players believing Meta Knight to win the matchup, which is additionally better supported by results), and strong tournament results although Pikachu's representation is small for a high-tier character. However, despite its high position in the American tier list, it is much lower in the Japanese tier list, where it is placed 22nd. Pikachu's most salient feature, as with its appearances in previous Smash Bros. games, is its speed. Pikachu also has good specials, excellent smash attacks, decent tilts, the ability to crawl (although Pikachu retracts its tail over its body when it crawls backwards, which allows it to be hit by projectiles that normally would not hit it while crawling forward), fairly useful throws, very good recovery, and is able to wall jump. Pikachu is a fairly small target, but this comes at the price of being the 5th lightest character, tied with Meta Knight (making it easily be knocked off-stage by a strong smash attack) and having the smallest shield in the game (making both shield stabbing and shield breaking easy). Pikachu's best game is played on the ground, at a medium range. Its forward tilt has very low range but its knockback is not bad for a tilt. Up tilt is very fast and launches opponents into the air, while the down tilt can trip them on the first hit. The ground is where Pikachu's smash attacks can be used to the fullest. Pikachu's up smash is one of the fastest in the game, with decent power to boot, and is excellent for KOs while its down smash locks the opponent for multiple hits if not SDI'd, functioning as a panic button of sorts for close encounters. Both of these smashes produce powerful vertical knockback, and can be followed by Thunder for a Star KO (called Thunderspiking) - this is very useful against floaty characters, especially ones with bad air dodges, most notably Peach. Down smash can also counter stale-move negation due to having multiple hits, but one drawback is that it can be SDI'd out of. The forward smash is a good tool for edgeguarding and KOs off the side. All of its smashes, however, have poor range like most of its other moves, with the forward smash having a very weak sourspot at the tip. Thunder Jolt is Pikachu's neutral special move, and is a useful move to keep most opponents at bay, as well as forcing them in the air. Thunder Jolt is a ground-hugging projectile, meaning opponents can't escape it by ducking or crawling. If it is used in the air, it travels diagonally towards the ground. It can also travel up walls, along ceilings, and below the edge, meaning that it can knock edgehoggers off the edge (this can also be done if Pikachu is high enough when recovering). Skull Bash and Quick Attack are both good recovery techniques, although Skull Bash is easily punishable by edgeguarders, able to be stopped by certain projectiles (such as Waddle Dee Throw), and requires charging time, but it can knock edgehoggers off the ledge. Edgeguarding Pikachu is difficult due to its recovery being unpredictable, as Quick Attack can be aimed in two different directions, giving Pikachu many ways of returning to the stage. Quick Attack also opens options for mindgames, by confusing opponents about Pikachu's actions. The most common form of this is QAC (Quick Attack cancel), allowing Pikachu use any special or aerial move after. On stages like Smashville, if a platform is offstage, this can be done off the platform easily. However, QAC is mainly used for approaching, as it allows Pikachu to quickly dash towards the opponent while attacking. It is also possible to aim Quick Attack diagonally towards the edge, and grab it, if Pikachu is at the right distance. Pikachu's most well known move is Thunder, which is one of its best KO moves, KOing reliably at around 100% if the opponent is hit by Pikachu while the move is being used. The bolt itself can also Star KO with the aforementioned Thunderspiking technique. Pikachu can also use Thunder just off the ledge so it covers the area just to the side of the ledge offstage, which is very difficult for characters with linear recoveries to break through, but not very effective against characters with long, safe recoveries such as Meta Knight and Jigglypuff, while also being dangerous if done too low. Pikachu needs to watch out for anyone who has a reflector move, as if the bolt is reflected, the knockback is dealt to Pikachu. Also, if two or more characters reflect the Thunder, it will cause Pikachu to jump to 100-500%, KOing it instantly (however, this is obviously never seen in singles matches and is rarely ever seen in doubles matches due to the difficulty of pulling it off, meaning it is a negligible disadvantage). Pikachu's aerials are its weakest area, despite having one reliable aerial KO move. Its forward aerial is weak in damage but can carry momentum through, whereas its neutral aerial is slightly stronger, but negates all momentum, and causes Pikachu to fall during the move; however it is a reliable finisher, especially when offstage or out of a QAC, and can be used in combos. Up aerial is extremely weak and has lost its semi-spike properties from Melee, but can be used as a juggling tool, and is decent in short combos, such as following into a nair, either straight after or after a midair jump. Down aerial and back aerial are laggy when they hit the ground, but all of the down aerial's landing lag can be avoided if it is used at the start of a short hop, or autocanceled. The down aerial has two hits plus an extra hitbox if Pikachu hits the ground, and is a decent finisher, particularly offstage, but not as powerful as the neutral aerial. Pikachu has two throws that are possible to chaingrab with - forward and down throws. Its forward throw works as a running chaingrab that can rack up damage and counter stale-move negation due to having multiple hits, while the down throw is a standing chaingrab that works reliably against the majority of the cast, with the exception of floaty characters. It can also easily be followed with an up smash, which can lead into a Thunderspike - Pikachu can use the down throw chaingrab as a zero-to-death combo on the space animals and Captain Falcon by chaingrabbing until a high enough percentage, then an up smash followed by a Thunderspike. Pikachu's back throw can easily set up to an edgeguarding chance, as it moves a considerable distance backward with the opponent while performing the throw. Up throw is another move that launches opponents into the air - at higher percentages, it launches most characters high enough to follow up with a Thunder, but against characters that are floaty and/or have high air speed, this is easy to escape. Pikachu was buffed from Melee to Brawl despite already being a mid-high tier character, though it was considered a low tier character when Brawl released. Pikachu's range has been improved on many attacks and Pikachu's multi hit moves have been altered to make them work more reliably. Pikachu's Quick Attack has significantly more utility mainly due to the introduction of Quick Attack Canceling but it also benefits from the changes to locks making it a powerful locking tool when used in conjunction with Quick Attack Canceling. Pikachu's strong recovery was improved even further as it has greater aerial mobility and Skull Bash charges faster and travels further. The general changes to Brawl's mechanics have benefited Pikachu in multiple ways. The universally decreased falling speeds helps Pikachu as it makes thunderspiking more effective and Pikachu's own lower falling speed improves its recovery and allows Pikachu to regain the ability to auto-cancel most of its aerials in a short hop. Thunder itself also has less ending lag making it safer and when combined with the reduction of Pikachu's falling speed makes Thunder a stronger stalling option. The inclusion of footstooling also benefits Pikachu more than most other veterans as Pikachu has one of the most reliable methods to set up into it in the form of up aerial which can then lead into a QAC lock. Pikachu also has a more consistent chain grabbing game. While up throw can no longer chain grab or combo due to the universally decreased falling speeds and the introduction of hitstun canceling, the removal of DI with moves which don't put opponents into tumble makes forward throw a more consistent grab and down throw no longer puts opponents into tumble allowing it to also benefit from this change. Down throw can now consistently 0-death fast fallers because of this change. Pikachu's grabs are also faster and have more range. Pikachu can also make great use of momentum canceling due to its quick up aerial and Skull Bash being a strong tool to negate momentum noticeably improving Pikachu's endurance despite its lower weight. Pikachu did receive some nerfs, mainly to its power. While some moves have increased KO power (such as neutral aerial), other attacks have either reduced damage, knockback or both. The move which received the most severe nerf to its power was up smash which went from the strongest up smash in Melee to an up smash of below-average power in Brawl. Up smash is also slower further hindering its utility although it is more reliable at setting up into thunderspikes. Pikachu's edgeguarding is also less effective not only due to the general buffs to recoveries but also because Pikachu's up aerial has much lower base knockback significantly hindering its use as an edgeguarding tool. Overall, Pikachu retains most of the strengths it had in Melee and the changes to Brawl's mechanics benefit Pikachu far more than many other returning veterans. As a result, Pikachu is one of the stronger characters in Brawl and has seen strong results although it still struggles against a few characters such as Ice Climbers and Olimar. Nevertheless Pikachu remains a threat to most of the cast and it even has a very strong matchup against other high/top tiers such as Snake, Falco and Zero Suit Samus. Some of Pikachu's proportions have been altered slightly. One example is its tail being thicker. Pikachu's colouring has been slightly softened. Pikachu has a few new sounds, which sound slightly "bouncy". Some attacks have new hitboxes. Pikachu has two new costumes that replace its Blue and Green Team colors in Melee. Instead of wearing a blue party hat, Pikachu's blue costume now has it wearing blue goggles similar to Pichu's blue costume. Instead of wearing a green cowboy hat, Pikachu's green costume now has it wearing a green headband. Pikachu is slightly lighter (80 → 79). Pikachu dashes slightly slower (1.8 → 1.765). Pikachu has a noticeably better survivability, with up aerial and Skull Bash being usable as momentum cancelling moves as well. Pikachu can now wall jump much like Pichu, aiding its recovery. Pikachu can now also crawl. Pikachu's air speed has been slightly increased (0.85 → 0.9118). Pikachu's air acceleration is higher (0.05 → 0.1). Pikachu's falling speed was reduced (1.9 → 1.5). When comparing to the returning veterans, Pikachu falls faster, worsening its recovery and making Pikachu more vulnerable to combos, but improving its endurance. Pikachu's gravity was decreased (0.11 → 0.087). This weakens its vertical endurance but makes it less vulnerable to chaingrabs. Jumpsquat is longer (3 frames → 4). Pikachu's short hop is higher (1.7 → 1.736). Pikachu's traction is lower (0.09 → 0.0596), especially when comparing with the returning veterans, now going from the 5th highest in Melee to only the 17th highest. This makes it harder for it to punish out of shield while providing marginal benefits in comparison due to the removal of wavedashing. Neutral attack has decreased knockback (7 (base), 50 (scaling) → 4/30) improving its ability to chain into itself. It also has a 10% tripping chance and Pikachu can now hold out neutral attack if the player holds the attack button making neutral attack much easier to spam. Forward tilt deals more damage (9%/8%/7% → 10%/9%/8%) and has higher base knockback (10 → 15). Forward tilt has a shorter duration (frames 5-10 → 5-6). Up tilt deals less damage (7%/6% → 7%/6%/5%) and has a shorter duration (frames 7-14 → 7-13). Down tilt now has a 30% tripping chance. Down tilt's angle has been altered (35° → 361°). Dash attack deals less damage (8% → 7%). Forward smash has slightly decreased startup lag (frame 16 → 15). Forward smash's sweetspot has altered knockback (25 (base), 92 (scaling) → 70/60). Forward smash deals less damage 21% (early), 19% (clean), 18% (late) → 20%/17%/14%) and the sourspots have significantly lower knockback (25/22 (base), 95/90/85 (scaling) → (50/40)/(70/60). Up smash has more startup lag with a shorter duration (frames 8-17 → 9-16) and ending lag (FAF 41 → 44). It also deals less damage (17%-19% (clean), 13% (mid) → 14%/13%/11%) and has less knockback scaling (110 → 90) significantly reducing its KO potential. It is no longer the strongest up smash in the game now being an up smash with below average KO potential. Down smash deals more damage (13% → 15%) due to changes to stale move negation and its final hit has a larger hitbox (10u → 12u) and has higher knockback scaling (170 → 190) giving it more KO power, and the first few hits have larger hitboxes (4.8u/2.4u → 5.76u/2.88u) are harder to SDI out of (though still very easy). This significantly improves its utility. It also has less startup lag (frame 7 → 6). Down smash has more ending lag (FAF 51 → 55) and the multi hits have a higher SDI multiplier (1x → 1.2x). Neutral aerial has higher base knockback (18 → 22), giving Pikachu a reliable aerial KO option. Pikachu can now also auto-cancel it in a short hop due to its lower fall speed (this also applies to Pikachu's forward and down aerials). Neutral aerial has a shorter durartion (frames 3-28 → 3-25) and has more landing lag (15 frames → 25). This combined with the loss of L-canceling makes neutral aerial much worse as a landing option. The late hit also deals less damage (9% → 6%) although its base knockback was compensated (0 → 20). Forward aerial deals less knockback (0 (base), 100 (scaling) → 40/20) and has lower hitlag (1x → 0.7x) allowing it to connect more reliably. It now has a new final hit which knocks opponents away with higher damage (2% → 3%) and knockback (0 (base), 100 (scaling) → 70/90). This gives forward aerial significantly more utility as it deals more damage (7% → 11%), works more reliably and is much more effective at edgeguarding. It also has less landing lag (20 frames → 15). Back aerial has more hitboxes covering the whole of Pikachu giving it more range despite having smaller hitboxes (3.6u/3.6u → 3u/3u/3u/3u) and making it easier to land. Back aerial deals stronger knockback (20 (base), 100 (scaling) → 40/120) and is now a multi-hitting attack. This improves its damage-racking and edgeguarding potential, but hinders its spacing and comboing potential. Up aerial has less landing lag (26 frames → 24) and deals more damage (4% → 6%/5% (clean), 5%/4% (late)). Up aerial has much less base knockback (100 → 40/30) and the semi-spike portion of the move has been removed. This weakens its edgeguarding potential, but improves its comboing and juggling potential. This is especially useful considering the introduction of hitstun canceling as it now has low enough knockback at lower percents for it to not put opponents into tumble and therefore, prevent hitstun canceling. Down aerial has a much bigger hitbox (5.62u/4.762u → 6.744u/5.722u). Down aerial's landing hitbox deals much more knockback. This removes its combo potential, but significantly improves its spacing potential. Down aerial has less knockback scaling (100 → 80) hindering its KO potential. Grab has significantly more reach, no longer being the shortest grab in the game. Pikachu's grabs also have less startup lag (frame 7 (standing), frame 11 (dash) → 6/9). Dash grab also has less ending lag (FAF 40 → 39). Pummel has decreased ending lag (24 frames → 15). Back, up and down throws no longer have an electric effect. Forward and down throws can now be used as chaingrabs due to changes to DI, with the former working on the majority of the cast and dealing more damage due to changes to stale move negation (9% → 10%), and the latter no longer puts opponents into tumble making it usable as a 0-death combo on some characters when finished with a Thunderspike. The universally decreased fall speeds and the introduction of hitstun canceling has significantly hindered up throw's combo potential and completely removes its ability to chaingrab, while it still lacks reliable KO potential. Thunder Jolt has a slightly longer duration (99 frames → 100) and has higher knockback. Thunder Jolt has more startup lag (frame 18 → 19) and deals less damage (7% (grounded), 10% (aerial) → 6%/9%. Pikachu can also no longer fast fall while using Thunder Jolt. Skull Bash charges faster and travels farther, improving its approaching and recovery potential. Skull Bash can now also be used for momentum canceling greatly aiding Pikachu's horizontal endurance. It also deals more damage when not charged (4% → 7%) and knockback (15 (base), 90 (scaling) → 40/80). Skull Bash's charge time can no longer be lowered by performing the move like a smash attack. Fully charged Skull Bash also deals less damage (29% → 25%) weakening its KO potential. Pikachu can now Quick Attack Cancel, allowing it to quickly approach while being able to attack and/or jump. This significantly improves its ability to approach opponents. Quick Attack also has much less endlag when used into the ground (which can be further decreased with QAC). Additionally, Quick Attack can now be used to lock opponents. Quick Attack cannot travel vertically twice any longer and travels a slightly shorter distance, hindering its recovery potential. It also has more startup lag (frame 13 (hit 1) frame 27 (hit 2) → 15/30) and no longer cancels landing lag if Pikachu enters free fall high above the stage before landing. Thunder has less ending lag (making it much less punishable) and the shockwave has a larger hitbox (12u → 14.4u). Additionally, the universally decreased falling speeds increases the thunderbolt's KO potential when used as a Thunderspike and Pikachu's lower falling speed makes it a more viable recovery option. Thunder can now also be B reversed and can be used with Edge momentum shifting giving it more utility. A down special used to set up a wall of Thunders offstage to edgeguard. 2% An extremely quick headbutt. Does very minimal damage and has short range, but can be used rapidly to refresh stale move negation. If the A button is held, it can deal more damage to nearby opponents and randomly cause them to trip. 10% Plants itself on its upper paws and kicks its lower paws in front of its body. If it is used right next to the opponent, it knocks them backwards behind Pikachu. Has high knockback scaling but below-average knockback. 7% (close), 6% (mid), 5% (far) Swings tail in an arc above itself. Good for juggling fast fallers. 7% Does a quick, low tail whip. Very quick in terms of both startup and ending lag. 7% Jumps forwards, headbutting. While it does have some knockback, it is rather laggy and leaves Pikachu vulnerable, making it vulnerable to shield grabing. 20% (early), 17% (clean), 14% (late) Rears back, then ejects an attached jolt of electricity from its cheeks while leaning forwards. The further away Pikachu's opponent is, the less damage and knockback it does. The move deals most damage when the opponent is directly in front of Pikachu. 14% (clean body) 13% (clean tail), 11% (mid), 7% (late) Flips very fast, attacking with its tail. A great followup to a down throw, being a rather good vertical KO move despite being greatly nerfed from Melee. This can combo into Thunder for a Star KO - often called Thunderspiking. 2% (hits 1-6), 3% (hit 7) Spins on the floor and releases electricity. A good move for racking up damage, and a powerful vertical finisher, but it is not too hard to SDI out of it before the final hit. Can also be used for spacing. 12% (clean), 6% (late) Curls up in a ball and repeatedly somersaults. Extremely fast startup with good horizontal knockback, making it a good aerial finisher or a useful edgeguarding move. 2% (hits 1-4), 3% (hit 5) Drills forward in the air with electricity. Deals multiple hits with the final hit dealing minimal knockback. The attack itself has little landing lag, which can potentially set up into a grounded move or a grab. 1% (hits 1-7), 4% (hit 8), 4% (landing) Spins in a manner similar to its down smash, but without electrical effects. The move consists of multiple hits, with the final one dealing decent knockback. Has high landing lag. 12%, 4% (landing) An electric drill-like moving downwards. Deals horizontal knockback. Has both noticeable startup and landing lag. 2% Zaps the opponent. A quick pummel. 2% (hits 1-4), 2% (throw) Places the opponent on its back and shocks them, sending them forward. A multi-hit move. Can chain throw almost all characters. 9% Does backwards somersaults with the opponent, then flings them behind itself. Pikachu moves a considerable distance before throwing opponent. 5% (hit 1), 5% (throw) Headbutts opponent upward. Does not have many followup options and does low damage, with a down throw usually being a better option. 5% (hit 1), 5% (throw) Slams on top of opponent. Can chain throw certain characters, especially fast-fallers like Fox. 6% Gets up and headbutts both sides of itself. 6% Gets up and kicks both sides of itself. 5% Gets up and hits both sides of itself with its tail. 8% Quickly climbs up and whips its tail. 10% Slowly climbs up and whips its tail. Thunder Jolt 6% (grounded), 5% (airborne), 9% (in air) Fires a jolt of electricity forward. Pikachu's main projectile, and a very useful move for keeping onstage opponents at bay and threatening offstage recoveries. Travels forward whilst bouncing along the ground, and can also travel up walls, below the edge, and along ceilings. If used in the air, it will travel diagonally down instead. Disappears after about 3 seconds. Skull Bash 7% (uncharged)- 25% (fully charged) Charges and, when the B button is released, fires itself forward like a missile. When fully charged or close to fully charged, it has good KO power. Primarily used as a recovery move, as it gains a lot of horizontal distance (especially when charged) and does not leave Pikachu helpless. WHen used on the ground, it has high landing lag. Quick Attack 3% (first warp), 2% (second warp) Moves at warp speed in two directions that can be selected via the control stick. Pikachu's main recovery move, and a quick, unpredictable move at that. The second warp is optional, but if used, the direction must be 45 degrees different than the first direction to work. Thunder 10% (bolt), 17% (blast) Shouts "PIKA! ", then a large thunderbolt comes down on Pikachu. The move in general is rather laggy, but if the opponent is hit by the shockwave around Pikachu when the thunderbolt lands on it, it deals massive horizontal knockback. If the opponent is hit by the bolt itself, it deals moderate vertical knockback, which can KO off the top screen (called Thunderspiking). It is also possible for the bolt to not hit Pikachu, by moving in the air after using the move. Volt Tackle 13-25% Turns into a gigantic ball of blue colored electricity that flies around the stage at high velocity. The attack button can be pressed to create a large discharge, increasing knockback. Can rack up damage quickly. Emerges from a Poké Ball, then briefly surrounds itself in electric sparks. Up taunt: Pikachu creates rings of electricity around it, saying "Piiiiiii!" Side taunt: Turns to the camera, waving both paws and says "Pika, Pika!" (updated version of taunt from Smash 64 and Melee) - its mouth is open wider when facing left and its head is less rotated because of the leg when facing right. Down taunt: Pikachu rolls on its back and says "Pikaaaahh!". Scratches one of its ears. Up: Its ears perk, and it scratches its left ear. Right: Lies sideways on the ground, sleeping. Pikachu's matchup spread, according to the current SmashBoards matchup chart, has the sixth highest unweighted rank, the sixth highest total, and the fifth highest weighted total. Pikachu has overall very favorable matchups. Pikachu is countered by one character, soft countered by four, has five even matchups, soft counters ten, counters twelve, and hard counters four. Pikachu is notable for being the only character in the game to have an even matchup against Meta Knight, though there has been much dispute over this and many think the matchup is actually in Meta Knight's favor. Pikachu tends to have a strong advantage against characters who it can chain throw with its down throw - it notably counters Fox, Wolf, Sheik and Falco due to their extremely fast falling speed acceleration, which makes them unable to escape the chain throw until KO percents, like most characters can; Pikachu can 0-death Fox, Sheik, and Captain Falcon using its down throw, and it can perform a similar 0-death on Wolf and Falco if Pikachu performs a fresh down throw at 20% if the down throws are buffered. Pikachu also does well against characters who it can easily outspeed and outmaneuver using QAC. Pikachu tends to have trouble against characters who can easily beat it in the air, and characters whose playstyle forces Pikachu to fight in the air, such as Olimar, Ice Climbers, Lucario, Diddy Kong and Marth. Anther - A top Midwestern Pikachu player, with top 8 finishes at Apex 2009 and S.N.E.S..
ESAM - A nationally dominant Brawl player from 2010-2014. K Prime - Pikachu player from Texas. NinjaLink - Known as one of the best Pikachu players in Brawl's early days; he also played a variety of characters at the tournament level. PikaPika! - A top Pikachu player in Brawl's early days, placing 7th at S.N.E.S. Ranai - One of the best Pikachu players in Japan; known as Hayase during the Brawl era. Shimitake - One of the best Pikachu players in Japan. Z - Considered one of the best American Pikachu players behind ESAM. Since the first tier list, Pikachu has always been a high tier character. The first tier list put it at 12th place, and since then, it has risen slightly, currently being at 8th place at the top of high tier. Pikachu's rise was mainly due to its huge number of techniques being discovered, with ESAM being credited for many of them, and its positive matchups. Despite its high tier placing in the North American Smash Back Room tier list, Pikachu isn't very common in tournaments compared to other top/high tier characters, and it ranks significantly lower on the Japanese tier list, with ESAM currently being the only Pikachu player who places very high at national tournaments. Pikachu is first seen when Zero Suit Samus enters a lab on the Isle of the Ancients. She finds that Pikachu is having its electric energy drained by a device, and uses her Plasma Whip to break the glass encasing Pikachu. With their common goal of revenge on the Subspace Army, they infiltrate the Research Facility to find Samus' Power Suit. After going through the first area of the Research Facility, Zero Suit Samus and Pikachu discover a monitor room, and learn the location of Samus' Power Suit. They then traverse another section of the Research Facility. They cross a bridge to reach the Power Suit. When Samus approaches the Suit, she and Pikachu are ambushed by two Shadow Bug clones of her Power Suit. After defeating them, Samus regains her Power Suit, and after defeating a small R.O.B. Squad, travel through the last area of the Facility. Later, the duo almost exit the Research Facility, but are then confronted by Ridley, who brutally damages Samus by dragging her across the wall. Pikachu uses Thunder on Ridley to stop him. Samus falls back down onto the platform, her Power Suit damaged, but working, while Ridley, enraged by Pikachu's electric shock, roars at them. The two then fight and defeat Ridley. After defeating Ridley, Pikachu and Samus leave the facility and notice a pair of R.O.B.s carrying a Subspace Bomb. They prepare to enter the Subspace Bomb Factory. They infiltrate the Ancient Minister's base, and eventually enter a large room, with him, an army of R.O.B.s, and a great number of Subspace Bombs on racks behind them. They prepare to fight him but pause, noticing that Ancient Minister is looking down as if he's sad. As they stare at his sorrowing, Donkey Kong, Diddy Kong, Captain Falcon and Olimar and his Pikmin break into the same room. DK smashes the doors open with his fists, and the four barge into the room. They also want to attack the Ancient Minister, but a hologram of Ganondorf appears. He commands the R.O.B. Squad to activate the remaining Subspace Bombs. The Ancient Minister tries to stop the Squad as their leader, but Ganondorf forces them to mindlessly attack the Ancient Minister using a reprogramming device. As the Ancient Minister sulks in flames, the brainwashed R.O.B. squad starts to take the Subspace Bombs off the racks. Ganondorf laughs at the Ancient Minister's despair, and sends the Subspace Army to distract the fighters. Auroros fly towards the group, but the Ancient Minister fires energy beams at them before they get near the fighters. The Ancient Minister reveals itself to be a R.O.B. himself, the lead R.O.B, and joins the five other heroes in fighting the Subspace Army. After they defeat the Subspace Army, the heroes attempt to detach the R.O.B. squad from the Subspace Bombs. Captain Falcon throws the R.O.B.s, Samus uses her Grapple Beam, while Donkey Kong and Diddy Kong use sheer force. Nothing detaches the R.O.B.s from the Subspace Bomb. The lead R.O.B. attempts to get them to willingly detach, and two members of the Squad respond, apparently unable to detach themselves. The R.O.B. looks down in despair, and Captain Falcon calls his Falcon Flyer so they can escape. After descending through the Subspace Bomb factory escape tunnel, full of members of the Subspace Army, they escape on the Falcon Flyer. Meta Ridley chases them down with the intent of revenge on Samus and Pikachu. They fight his mechanically enhanced form on top of the Flyer, and defeat it. Pikachu and the rest of the group then join the ground heroes and Halberd Battleship heroes, and help them out throughout the rest of the adventure. Unfortunately, when these characters reach Subspace, Tabuu turns everybody, including Pikachu, into trophies using the terrible Off Waves. However, thanks to the efforts of King Dedede, Luigi and Ness, the characters are revived, Pikachu included. Once they regroup with the trophies that Kirby and the others revived, they set off to enter The Great Maze. When they approach Tabuu, Sonic appears and saves them from his Off Waves. They then finally defeat Tabuu, and returned the Subspace Bomb-ed portions of the World of Trophies back to their original places, except the Isle of the Ancients, which Pikachu and the rest look on at in triumph. Event 8: Go! Triple Finish! : The player controls Pikachu and must defeat Squirtle, Ivysaur, and Charizard on Pokémon Stadium. Event 10: All-Star Battle Regulars: Pikachu is one of the opponents fought in this event. All opponents are starters from the original Super Smash Bros. game. Event 12: Sleeping in the Eggs: The player controls Yoshi and must put both Kirby and Pikachu in eggs simultaneously. Event 14: Sproutrage of the Flower Pikmin: Olimar must protect 6 Pikmin until their flowers bloom from Pikachu and the Pokémon Trainer. Co-Op Event 2: Master the Pokémon Tag Battle: A team of Pikachu and the Pokémon Trainer must defeat another team of Pikachu and the Pokémon Trainer on Pokémon Stadium 2. Pikachu's main and Final Smash trophies can be obtained by clearing Classic Mode and All-Star mode respectively with Pikachu. Pikachu, transformed into a ball of light that can slam into foes. It can also fly to chase down those who try to jump out of range. Sparks get stronger when you press the attack button. However, its increased inertia makes midair movement tough. If you get carried away flying, the effect will end, and you'll destroy yourself. Be careful it doesn't happen to you. Some of Pikachu's new attributes, such as wall-jumping and its goggle costume were previously held by Pichu in Melee; additionally, Pikachu can traditionally only learn Volt Tackle if it evolved from a Pichu in breeding. The Smash community has noted these similarities, and a common fan theory states that the Pikachu in Brawl is actually an evolved form of the Pichu from Melee. By the time Brawl was released, gender differences were introduced in the Pokémon games. Female Pikachu have a heart-shaped indent on their tails, while the one in Brawl doesn't, supporting the common assumption that the Pikachu in Brawl is male. Pikachu's gender, however, has never been explicitly revealed. Pikachu has the least amount of palette swaps in Brawl, only having four instead of six like most characters. Pikachu, Samus, Fox, Diddy Kong, and Lucas are the only characters in the Subspace Emissary to fight more than 2 bosses (excluding boss re-creations in the Great Maze). Pikachu can be chosen to fight Ridley at The Research Facility Part II, Meta Ridley at The Subspace Bomb Factory (Part II), and as well as Tabuu in the final battle at Tabuu's Residence if it is rescued in Subspace (Part I). Pikachu's AI has a reputation of being a candidate for the best AI of any character in the game, on par with Luigi's. While the common consensus is that CPU Luigi has the superior AI, it has been observed that level nine Pikachu will almost always win against most level nine CPUs under tournament rules, and will win more often than not against every other level nine CPU, including level nine Luigi. Pikachu, Zelda, and Snake are the only characters in the game where all three of their taunts temporarily make a held item disappear. Brawl is the only game where Pikachu's blue party hat is not one of its alternative costumes. Pikachu's page at Smash Bros. DOJO!!. This page was last edited on April 14, 2019, at 13:06.